Devoid Of Culture And Indifferent To The Arts: Foraging 12: Daisies, daisies, everywhere… and something to eat! Foraging 12: Daisies, daisies, everywhere… and something to eat! So the time is fast approaching, if it already hasn’t arrived where you live, when the perennials poke their heads through the ground and reach toward the sun. 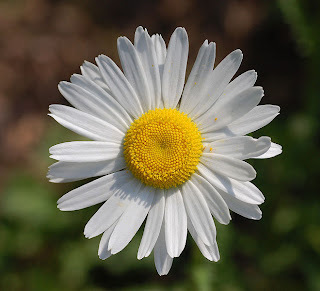 There are three particular ones that I would like to discuss today, and all three have the common name of “daisies.” It can get a little confusing when different flowers, not even from the same genus, share the same name. I speak of Leucanthemum vulgare, Leucanthemum supurbum and Bellis perrenis. Huh? you say… Well they’re all "daisy" but are different beasts. The most common of the three is most certainly vulgare. Vulgare is Latin for “common.” This is our common daisy that grows just about everywhere in North America and Europe and is much loved. Children’s rhymes, love and nature poems often mention them. In truth, they’re a perennial herb. They’re also a bit of a weed, but an appreciated one as their bright flowers continue from late Spring to early Fall. They reach a height of no more than 2 feet, with 2 inch white petals surrounding bright yellow centres. They spread by seed and creeping rhizomes. If you want more of these it’s quite easy to grant your own wish by collecting and sowing. Some people plant them in their flower gardens where they do well, but no matter how much you coddle them they will never grow to be more than what they are in the wild. Vulgare is where Leucanthemum superbum originated. This is the perennial “shasta daisy” that so closely resembles its wild cousin. 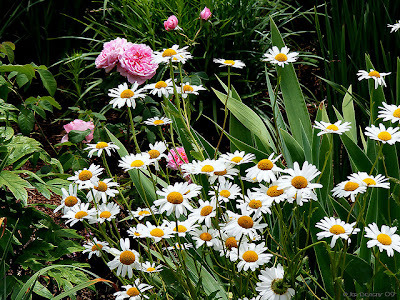 Shasta daisies were bred from previous attempts at improving the wild daisy for garden use. They were formerly classified as chrysanthemums, but have been moved to their own genus. Asteraceae is the “umbrella” classification of both the wild and cultivated daisies. So they are related to asters. 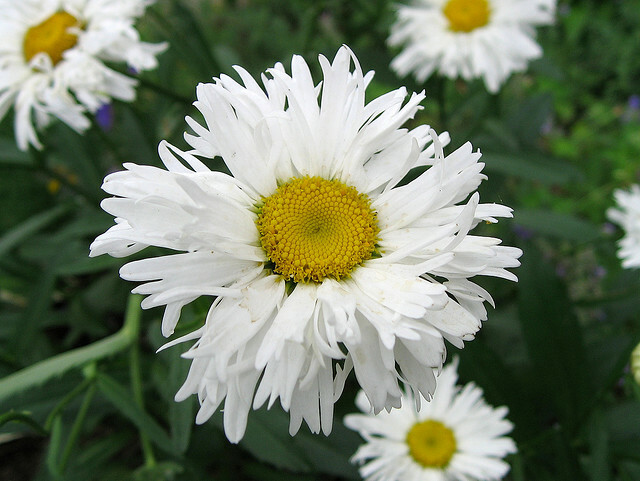 Shasta daisies have all the characteristics of vulgare except they’re larger. They can reach heights of 3 feet (I’ve seen taller) and are hardy in USDA zones 4 to 10. Shasta daisies bloom a little later than the wild form, but continue to bloom through to mid Fall. They are attractive to bees, as are vulgare, and are resistant to deer, supposedly. Also like the wild vulgare they have a bit of a rank odor. This is quite common to a lot of the aster family from my experience. Bellis. Besides being smaller, note the shape of the leaves. Now Bellis is different altogether. 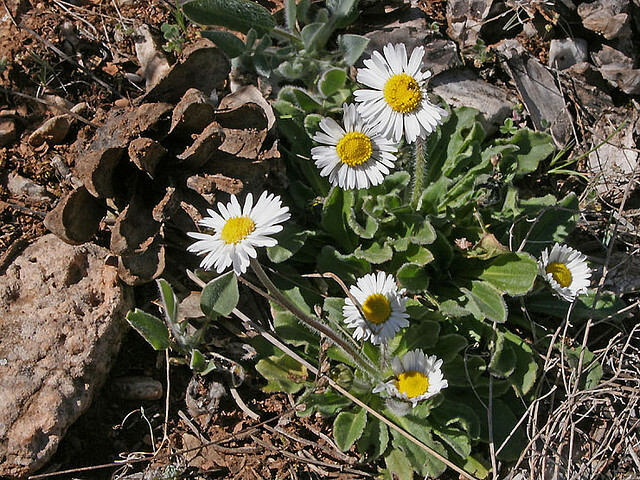 It is a small low growing plant that besides being called common daisy (confused yet?) is also called Lawn Daisy or English Daisy. This is the tiny version of the daisy form with flowers that only reach 1 inch wide. The stems are leafless and only about 5-6 inches high. Sometimes the white flower petals are barely touched with pink. Although essentially the same flower in miniature as the others it is considered a nuisance for its propensity to populate lawns. Some cultivated varieties of Bellis are available in garden centres. The flowers on these have been bred larger and many are in rounded button form. Bellis also has astringent properties. Doctors accompanying the Roman Legions would pick sacks of them to extract the juice which helped heal battle wounds. But what if you don’t often have sword fights? There are two things you can do: either enjoy the beauty of the cheery flowers, or eat them. Yes, eat them. The buds of vulgare before they open are perfectly able to be pickled like—and substituted for— capers. I had never heard of it until I started researching this post. But companies actually sell them so it's actually true. Note on foraging: Use only Leucanthemum vulgare for this recipe. They’re plentiful enough. And always ensure you pick from an unpolluted spot. That means no ditches… The flower buds must be harvested after they are fully formed but before they show any sign of opening. Wash the daisy flower buds and trim the stems. Allow to dry thoroughly on the counter or in the sun. In a 450g jar (I have no idea what the volume of that is, but it should hold 3-4 cups) combine the black peppercorns, allspice berries, salt, mustard seeds and garlic. Then pack in the daisy flower buds. Add the white wine vinegar to a pan and bring to a boil. Take off the heat, allow to cool slightly then pour over the contents of the jars, filling them to the brim. Secure with vinegar-proof lids, label then store in an cool, dark, cupboard for at least 2 months to mature. I saw online that a Montréal company sells 110 ml jars for $6.99. The pickled buds can be used as a caper replacement in salads or added to sauces or stuffings for meat, chicken or fish. Perhaps we should all put some up.